Over ten years ago I saw The Hackensaw Boys play for the first time. Soon after they came to play again in the Q-Bus and their fiddler, sometimes bass player Tom Peloso had been replaced by Ferd Moyse. Having met the band by then, I asked were Tom was, "He joined a band called Modest Mouse", was the answer. Apparently he joined a pretty big band. You can run into the name Modest Mouse in various ways. Especially where commercial success is concerned. 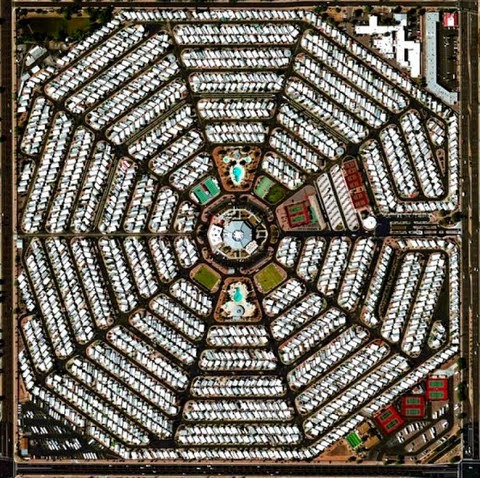 Strangers to ourselves is Modest Mouse's sixth album since 1996, the first in eight years. And Tom Peloso is still a member. He made a smart move from a commercial point of view and probably from a musically more diverse one as well. Stranger to ourselves is the first Modest Mouse album that I caught on release. The album gripped me immediately as the songs toss me around as if I'm the ball in a pinball machine. No song is the same and the mood changes are enormous. As is the context of a song. Overall it is probably o.k. to call the music indie rock, but within that moniker the music shoots into all sorts of directions. Modest Mouse exists for 22 years in 2015. Isaac Brock is the singer and front man, his drummer/percussionist Jeremiah Green is around for almost as long, as he left the band for a short period somewhere. The rest are all additions who caught on somewhere along the route. Isaac Brock plays with who he needs to play with it seems. This does not reflect on the popularity of the band. Despite the eight year omission Modest Mouse scored a number 3 album in the U.S. This band is much larger than a common European like me can ever imagine as the band doesn't do much in this country. Will Strangers to ourselves change that? I do not think so. There's not a song that will make it on the radio, is my guess. Next to that, listening to the album takes some stamina. The quiet way Strangers to ourselves starts with the title song, doesn't give away any inkling of what is to follow. The first single of the album. 'Lampshades on fire' is already so different. But you wait for 'Pistol'. All bars are let go there. Gangsta rap. Tough, mean. Something like that. It doesn't get that extreme afterwards, so that's behind us, but all sorts of indie rock come to the listener. Some Sparklehorse like singing and rougher alternative rock. Epic rock ballad? Why not. It's all here and then its changes back to some more Sparklehorse too ('Of course we know'). The fun is that 'Strangers to ourselves' is a beautiful ballad, 'Lampshades on fire' is an indie rocker sung with a rough voice. Both songs are so good, while so different. That is exactly the bar the listener is able to hold on to while listening. It's good, perhaps weird, sometimes extreme, but good. When all is said and done, my first words ought to be that Modest Mouse are Mark Linkous' heirs. Heirs that don't mind and dare to to do whatever they like, leaving fans of Sparklehorse behind with their hairs on end. Beauty, beast, prickly and weird. It's all there. A lot to discover. It really depends on my mood what I make of Strangers to ourselves. Sometimes it is just too much, sometimes I just sit drooling on the couch not able to do much else than listen in awe. This is demanding music and I can't always bring what it takes to enjoy it. So time has to tell where this album and I'm going. It could be either way. The fact that I'm contemplating buying it on vinyl may hint at a certain direction though. Strangers to ourselves may just be the right adventure to embark upon pretty soon, with no need to return in a hurry.